Product #15845 | SKU DJM-2000NXS | 0.0 (no ratings yet) Thanks for your rating! The DJM-2000 nexus DJ Mixer from Pioneer is a four-channel DJ mixer that features both analog and digital inputs and a built-in 24-bit/96kHz audio interface. It has a 5.8" LCD touchscreen display that can be used to control a variety of its built-in effects, including the DJM-2000 nexus's Beat Slice function, allowing you to create new track slices right on the touchscreen. 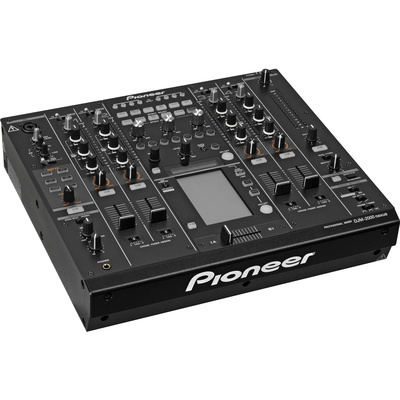 The unit also has compatibility with Pioneer's Pro DJ Link, allowing you to connect up to four Pioneer DJ players and two computers running the Rekordbox software via its LAN inputs. The Sync Master function then allows you to control the tempo and beat position from your ProDJ Link devices, quantizing your beat effects with the mix. Each of its four channels includes an independent three-band isolator EQ and channel fader. The master section features a peak limiter to help avoid distortion in your mix.